I recently went to watch this movie and I thought a lot about this class. Check it out! I went to go see Precious Knowledge this last Sunday night. I know I saw some people from the class and if you didn’t get to go, you should definitely try to watch it, it’s worth the watch! This is frightening because he is asking all people who come from different backgrounds to assimilate by giving up their culture, their heritage, their language. This enforces the idea that if you don’t act correctly “American” or “speak American,” you are refusing to be part of this country. This is very similar to the accusations being made against these Ethnic Studies classes. There was the assumption that just because they were learning history differently (some officials were very disturbed that teachers were insinuating that the Founding Fathers were racist -___-), because they were reading Pedagogy of the Oppressed, because of the Che Guevera picture in the classroom, because Spanglish and Chicano culture were given their due, that these students were being taught to hate the United States and be un-American. What is it to be American though? These officials, many of them older white men, decided that they were the ones who get to decide what being American is to young Chicano high schoolers. People who offer a different view of Americanism were wrong and were not being patriotic because they mentioned that Benjamin Franklin might have been racist. 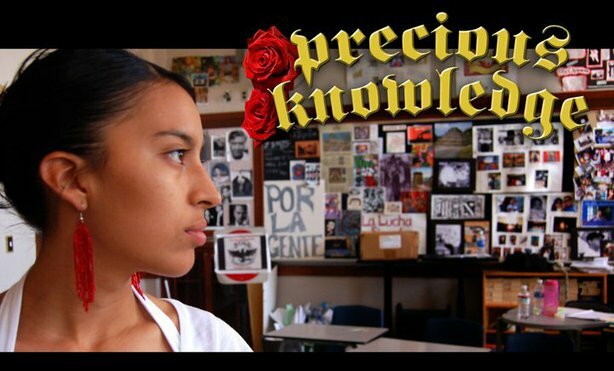 It seems that rather than appreciate Chicano culture that seems to be very prevalent in Arizona, the officials wanted to be rid of it and enforce a culture that these students did not identify with. Of course for me this brings to mind the Anzaldua and Rodriguez readings that we did at the very beginning of the year. I feel like for the most part, our class agreed more with Anzaldua’s reading of things. Rodriguez however spoke to me in another weird way. I seriously went through school the same way he did, even though I obviously have a different view of the experience because I am in strong support of bilingual education and affirmative action. Watching this film, he seemed to have opinions similar to those of Tom Horn, all this “unnecessary” stuff like Ethnic Studies, etc. He seems to be a product of this type of thinking that is now threatening the Ethnic Studies in Tucson. Anzaldua on the other hand seems to have been/be in a similar place to these students, trying to discover her Chicana identity and navigating through life as displaced and confused, the way many of these students must feel. Her different works capture the struggle she undergoes when she is not fully accepted as American or Mexican, therefore she is a Chicana. And lastly, there is a petition that Ajua Campos and other groups have begun circulating in support of keeping Ethnic Studies in the Tucson Unified School District. Please sign it if you haven’t already! I read quite a few of the poems from Paper Dance (because they were so good!). I really zeroed in on “La Curandera” by Diana Garcia (57). In this poem, aspects of “indigenous practices” are brought up. Something the poems have focused on is the negative ways in which “pagan” practices are/have been viewed. The main over view of the poem is that her grandmother asks her to get a scapular blessed for a novena for Don Jose, a man who is ill. Her grandmother is a Curandera, a healer. Since she is a healer, she makes teas for different afflictions such as flu, measles, insomnia, etc. However the priest refuses to bless the scapular. He dismisses their practice as “witchcraft,” even though there is a clear connection to Catholicism. So instead rubs the scapular in a prayer book, “hoping to catch stray blessings” (57). At the end of the poem, at the novena of Don Jose, when her Nana reveals the scapular, she says that, “Hail Mary’s rise, and I slip three steps from grace. I can never go to heaven if the old man dies” (58). Though this poem has many themes, this made me start thinking about was how in many different Latin@ cultures, there have been different ways of incorporating “indigenous” faiths with the “more accepted” ones. Curander@s exist in places such as Mexico, Bolivia and Cuba. This “mix” often seems to be a reaction to the forcing of usually Roman Catholicism on the people. In Professor Ann Wightman’s class Survey of Latin American History, one of the topics we discussed is syncretic fusion or basically the blending of two “entities” that is its own but also has aspects of the two entities that were blended. We also discussed how many times in order maintain their religion, people would place statues of their gods under the altar at Church so when they knelt before the altar, they knelt before their gods. Or when some festivals coincided with their religions’ holidays, they would say their own prayers rather than the Christian ones (“Colonial Contradiction,” HIST/LAST 245, Survey of Latin American History, Wesleyan University, spring, 2011.). Santeria was created in Cuba by the mingling of Yoruba traditions brought by enslaved Africans from Nigeria and Benin with the Roman Catholic faith of the Spanish plantation owners. Attempts were made to convert the enslaved Africans, but while they accepted much of the missionary teachings, they didn’t find that these provided sufficient ‘religious fulfilment’. They continued to practise their own rituals, which they found to be useful and effective, and which, most importantly, filled the spiritual space in lives torn from their original cultural foundations. For thousands of New Yorkers, such a ”toque” (pronounced TOE-kay), or performance for the saints, is now no more unusual — or secret — than attending shul or kneeling to Allah. Once dismissed as a ghetto religion practiced only by the Caribbean poor and uneducated, Santeria has a growing following among middle-class professionals, including white, black and Asian Americans. There are police officers in New York who pray to Obatala, the father of all deities, or orishas, before they slip on their gun belts. There are lawyers and professors, civil servants and musicians whose homes are filled with altars laden with flowers, rum, cake and cigars to keep the gods happy and helpful. Many dress in white to symbolize purity (Alvarez). Additionally, the BBC article on Santeria states, it is not an organized religion with a hierarchy or different associations or groups (BBC). It is also very much a do it yourself tradition today because those who are Santeros have to keep the traditions of Santeria alive within their own community, provide their own spaces for worship and figure out who the leaders of the community will be. This also made me think of the idea of queer-ness as a minority population. This topic has been brought up in many other posts. I see the practice of Santeria is definitely queer. Even though most Santeros seem to be Latin@, Latin@s are usually looked at as Roman Catholic. Also, many times when Santeria is in the news, it is portrayed as this cult that kills animals and is being investigated for animal cruelty. This negative view has caused people to really look at Santeria as this strange, “magic voodoo,” instead of a valid religion (Alvarez). Because of these depictions and lack of respect, Santeria has really been made into a “minority in the majority,” the majority being not only Catholic but people of so-called “valid” faith systems such as Christianity, Islam, Buddhism, Hinduism, etc. because these faiths are not viewed as cults. Of course “La Curandera” wasn’t necessarily about Santeria but it does seem to have a similar stigma of “witchcraft” and “cult activity” attached to it. We of course need to keep in mind that this religious blend is not true for all Latin@s, but this do it yourself attitude is still very present in some, if not many sections of the Latin@ religious community and it cannot be ignored or cast off as a “cult.” Since it managed by the practitioners who build and sustain their own religious community rather than go to a church, mosque, synagogue, temple, etc. this could be seen as DIY. And since Santeria is looked at as radically different from other religious because of trances and animal sacrifice, Santeria could be queer in the religious sphere because it does not conform to the norms that other more established religious communities seem to have set.